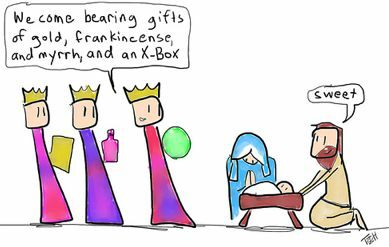 I frequently commemorate holidays on this web site by posting a Bible passage, so posting the cartoon above that cracks a joke about the gift-giving of the magi seems like a 180 from that, and possibly offensive to some. 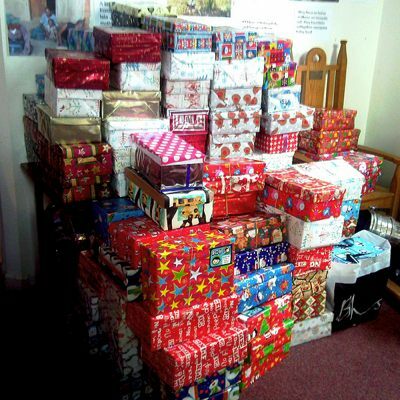 But today is Christmas, material gifts were given on the first Christmas, materials gifts will be given to my children and family today (including some last night), and material gifts were given earlier this month to kids in families with immigration problems in news that was so outstanding that I believe today - Christmas - is the right time for a follow-up. To recap, earlier this month, I posted about a Tennessean story describing kids being turned away from Christmas toy charity programs because of the immigration status of their parents, and about the subsequent outpouring of Nashville generosity to find toys for those kids. This follow-up is to mention the efforts of local writer Betsy Phillips and also the Nashville Area Hispanic Chamber of Commerce, who demonstrated wisdom in their generosity this Christmas season. Their efforts reveal the wisdom and generosity of many others, also named below. But, in what I count as a Christmas Miracle, both the Salvation Army and the Houston Fire Department seem to have recently “clarified” their policy and children in the same circumstances as Jesus was will no longer be turned away. It does take an act of God to get people to act decently toward each other. These are the folks next year who should get to be the Grand Marshalls of the city’s Christmas Parade. I have talked to TIRRC about whether they know of charities that don’t discriminate based on immigration status. They will be getting back to me. I will share what I know when I know it. The Lay Pastor for Integrative Ministries at the West Nashville United Methodist Church (they also could use some volunteer help this weekend, if you’re bilingual). As these posts demonstrate, Phillips readily and generously employs her passionate writing to shed light not only on the plights of immigrants but also on the boneheadedness or kindheartedness of their hosts, whichever the case may be. The Nashville Area Hispanic Chamber of Commerce also organized a toy drive for children regardless of immigration status. The event attracted the rare bipartisan support of the Middle Tennessee Hispanic Democrats and the Republican National Hispanic Assembly of Tennessee, and news of the drive was picked up by NewsChannel5. That report was then picked up by the national blog LatinaLista. Over 200 children enjoyed toys, hot chocolate, food, singing, and time with Santa. The chamber posted photos of the event here. Photo by Terry Hart. Licensed under Creative Commons. "To introduce assimilated youth to their ancestry"
The Tennessean reports today on the Christmas celebration of Iglesia de Dios Hispana de Nashville, which is also advertised in the above video. The different offerings provided insight to the variety in Latin American culture even though the Spanish language unites most of the congregants, [Bishop Jose] Rodriguez said. The food and beverages also provided a way to introduce assimilated youth to their ancestry. "We have a lot who are born here with Latino ancestry, so we want them to know the customs," Rodriguez said. "It's a way to teach them and for us to learn from each other as well." This Hispanic Christian generational gap is a fairly universal phenomenon in immigrant churches. My family experienced it at a Spanish-speaking Southern Baptist congregation we attended for two years in Nashville, with the elders fretting about the deteriorating Spanish language skills of the youth group, and David Park has live-blogged the statistic that "up to 95% of post high-school churchgoers leave the ethnic church." Bridget Rivera's piece on her Southern and Latina identities is also insightful. By 1870 most of the Germans in the city belonged to the second generation. ... These younger Germans were much less concerned with maintaining European ties and traditions than their parents were. ... [T]hey had grown up in Tennessee and many of them had a distinctly Southern point of view. Earlier this month, I was buying a "tres leches" cake at the La Espiga bakery on Nolensville Road. If you haven't tasted tres leches cake, it's kind of moist. I don't really have a taste for it, but it's my wife's favorite, and it was her birthday. "I need your cooperation with little boy Axel. He was born with a bone problem called 'antigriposis.' 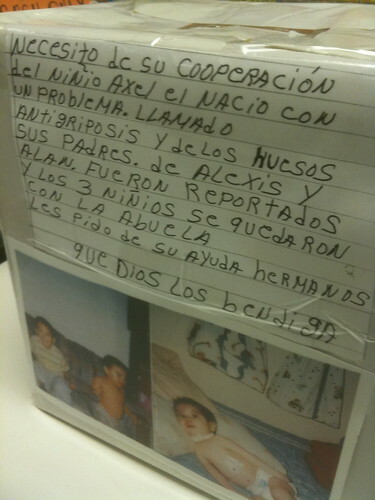 His parents Alexis and Alan were reported, and the three children stayed behind with their grandmother. I ask you for your help, brothers. May God bless you." Axel, Alexis, and Alan: three names of Hispanic Nashvillians. Two of them - the "reported" parents, may or may not return here to be Nashvillians ever again. If they do, it will almost certainly constitute an immigration violation, at least under current law. Before I sat down at the computer to post this picture and this story, I had thought "La Espiga" - the name of this bakery - meant "the crumb." Actually, "miga" is the word for crumb, and "la espiga" means, "the head of grain." It's a word that comes up a lot in the Bible. I went looking for some "head of grain" verses, and three of the four times the word appears in the Gospels is in a story about Jesus and his disciples being rebuked for lawbreaking. Look, why are they breaking the law by harvesting grain on the Sabbath? Haven’t you ever read in the Scriptures what David did when he and his companions were hungry? He went into the house of God (during the days when Abiathar was high priest) and broke the law by eating the sacred loaves of bread that only the priests are allowed to eat. He also gave some to his companions. My thoughts turn to Axel, Alexis, and Alan during this Nashville Christmas. Jews were very active in civic life in Nashville. Many were involved with non-Jewish fraternal societies like the Masons and Odd Fellows. A number joined German-speaking lodges, reflecting their strong German identity. Indeed, most of the sermons delivered in Nashville’s synagogues in the latter half of the 19th century were in German. They established Hohenwald (which translates into High Forest). The cultural traditions of the Swiss were kept alive by the Swiss Singing Society, a band called "Echoes of Switzerland," waltzes at Society Park in Hohenwald, and the annual production "Willhelm Tell." Church services at the Swiss Reformed and German Reformed Churches were conducted in German. Photo by Zadi Diaz. Licensed under Creative Commons. Whether the word "illegal" is an appropriate way to describe someone with an immigration problem is the subject of debate again. On Tuesday, USA Today prominently used the term "illegal students" in an otherwise informative article about students trapped in their immigration status, and Change.org organized a petition in protest. I think it's important to sign the Change.org petition, even though I would quibble with its wording. The use of "illegal" as an adjective or a noun has bothered me for a while. In October, 2006, a reader-inspired fake ad campaign (sample above) pointed out the ethical problem of how Americans break the law but never call ourselves "illegal." One of my January 2007 posts called out the Tennessean when it used the word "illegal" as a noun in a headline, a practice which the National Association of Hispanic Journalists said they are "particularly troubled" by. In October of this year, Kleinheider noticed my use of the term "visaless" in one of my stories about the Baby Yair case, in which the State wouldn't turn over a rescued baby to family members on the grounds of their immigration status. When a label is a criticism, it's ethically important for the label to be one that could apply to the person making the criticism. We all know we don't use "illegal" in the same way when we describe Americans with other legal problems. I remember seeing "illegal" used as a noun in an ABC News headline recently, so on a lark I just searched Google News for all ABC News stories using the word "illegal" in a headline. I went through ten pages of results, and there wasn't a single reference to an American lawbreaker. There were a few references to illegal conduct by Americans outside the context of immigration, but no use of the word "illegal" to describe the American person or people in the story. A Google search revealed some reference to "visaless" in reference to Americans traveling abroad without permission, so that gives the label greater credibility as one that could be used in reference to foreign citizens who are traveling or living abroad (here) without permission. The words "internationals" or "expatriates" are other words that are more often used to describe Americans abroad that could be adopted into our vocabulary of describing foreign citizens here. In describing the status of someone with immigration problems, "visaless" and/or "unvisaed" are also more specific than "illegal" or even "undocumented" or "unauthorized," because it's the lack of a visa that more specifically describes people without immigration status. Most visaless people usually are in possession of whatever documents the government allows them to have - you've never seen a visaless immigrant driving without a license plate, have you? And until the change in TN law, unvisaed immigrants had drivers' licenses, which made the concept of a driver who is legally licensed but still referred to as "undocumented" even more clearly nonsensical. If you search the web for "unvisaed" you don't see the term used much here in the U.S., except by me in the pages of HispanicNashville.com - but it's a commonly used term in Australia. As mentioned above, "visaless" is an even more common term. Both are reasonable alternatives. And just to be clear on two points: First, figuring out what word to use is not the same thing as figuring out or making a statement on what immigration law is or how people should act in regard to immigration law. Second, I use and have used a variety of terms to describe problematic immigration status (including the less favored ones described here), so my point in this post is not to force or prohibit the use of one term or another, but to encourage the use of the best possible terms. "I have called you by your name"
Along those lines of encouraging the use of the best possible terms, and all this having been said, it's worth remembering that the best label for someone is their name. Some people like to joke that those of us who resist the term "illegal" would call a thief in our homes an "undocumented explorer" or something like that. In response to that kind of joke, and putting aside for a moment the fact that they wouldn't use the term "illegal thief" either, my thought is that if someone is living and working in your house and getting paid for that work for a number of years, it's you who is out of place if you're calling them anything other than their name. Four-year-old Karla Montiel will be receiving gifts from kind Nashvillians this year, even though her parents were turned away from the Salvation Army Angel Tree program. The Tennessean first reported Sunday on children being turned away, even if they are U.S. citizens, from programs that require Social Security numbers from their parents. The Tennessean then reported yesterday on the backlash of support for those kids. Photo by Trevor Coultart. Licensed under Creative Commons. "Students and aficionados of Hispanic culture will want to witness firsthand this great event"
Students and aficionados of Hispanic culture will want to witness firsthand this great event, probably the most celebrated date in the Hispanic calendar. Below is the schedule of the 2-day event beginning on Dec. 11, as celebrated by Our Lady of Guadalupe Catholic Church in Nashville. NOTE: The first day's schedule is quite lengthy (about 7 hours) and no one is expected to stay for the complete duration of the event. Because parking may be scarce, we will meet at 7 pm at the K-mart located at the corner of Harding Place and Nolensville Rd., then carpool as a group to the church. Half a century ago, my mother operated a successful taco stand located in East Los Angeles. Eventually, she sold it to her sister, who parlayed that small business into a high volume Mexican food restaurant on the edge of the San Gabriel Valley. It wasn’t really a “sit-down” kind of joint, as patrons were required to order at one window, and pick up their food at another. In fact, for most of my life, the place didn’t have tables. My Aunt built her business on three items; taquitos, (seasoned beef or chicken tightly rolled into corn tortillas and fried to order) and red or green burritos. I remember countless hours sitting at my aunt’s feet as she rolled taquito after taquito. In front of her was a stack of warm tortillas, and a stainless steel pan with chicken or beef. She would roll 20 or 30 of them, then reach down and hand me one, un-fried, of course, and I would quickly gobble it down. They were soft and flavorful and I ate thousands of them growing up. Lately, I have been making them for my family, and the kids love them. Mack's parents, both of whom were Mexican citizens who served in World War II, are an intermittent subject on his blog. In a heartfelt 2007 Mother's Day post, Mack said, "If I could choose any set of parents for another go-around on this Earth, I would pick you and Dad every time." My mother arrived in this country in a shoe box, crossing over from Mexicali with her parents and older siblings. She grew up poor, worked as a migrant fruit picker, until she met and married my father, and started a small taco stand in East Los Angeles, after working in the factories during WW2. She had an 8th grade education, yet read voraciously. Eventually, she returned to school and became a vocational counselor to our growing Vietnamese community. She raised four children, lost one as a newborn. [She] was the type of woman that, if you showed up at her door at 3:00 a.m., she would make you feel that your visit was the highlight of her day, because it was. My mother loved unconditionally, I think this fact alone made her the most Christian person I ever knew, yet I can’t recall her ever setting foot in a church. She loved everyone like family. I mean everyone. Our house was always full of people, friends, family, and strangers, even, though I believe no one ever felt like a stranger for long in my mother’s home. She would happily cook for 1 or 100, it really didn’t matter to her. When I came home from school, or later, when I would just drop by to visit, she would head to the stove, and warm tortillas with butter magically appeared on a plate. My father was not a happy person. Sure, he had his moments, and the rest of the family never really knew how to deal with him when he was uncharacteristically joyful. He was explosive, violent, moody and reclusive. Until he returned from WWII, he had little education. His father died when he was young, probably from a combination of hard work and alcohol consumption. Not much is known about my father’s youth, the few stories passed down (almost always from his brother) portrayed him as a serious young man, prone to brooding and violence. I’m pretty sure that he never knew how to show his love except by providing, which he did well. He was detached, yet controlling. Almost all of my memories of my dad at home are of him sitting in his chair, reading. He read everything. He spent so much time in the local library that, when he passed, the library dedicated an entire bookcase to my father’s memory. I have spent much of my adult life wondering what it is that drove him. It was, I’m sure, a source of great pride that he went to college after the war (The G.I. Bill was and is a beautiful thing) and earned a degree in accounting. Some other Hispanic Nashvillians who could share memories of California are Conexion Americas' "Orgullo Hispano" award winner Miguel Gonzalez, Metropolitan Nashville Airport Authority President & CEO Raul Regalado, WLLC-Telefutura Channel 42 General Manager Eric Alvarez, Nissan Americas' Hispanic employees including Jaime Ortiz and Stephanie Valdez Streaty, one-time Nicaraguan prisoner Eric Volz, Vanderbilt professor Lorraine Lopez, former Metro Schools director Pedro Garcia and his wife Priscilla Partridge de Garcia, sheetrock hanger Jose Ramirez, and clothier Manuel. "My humanity is bound up in yours, for we can only be human together"
The TIRRC Convention is our biggest annual event where we come together as TIRRC staff, volunteers, supporters and member organizations to reflect upon the year, think strategically about 2010, and celebrate together as an immigrant rights movement. There will be some amazing workshops and trainings for individuals and organizations alike, as well as a Cultural Celebration Dinner to end the day! 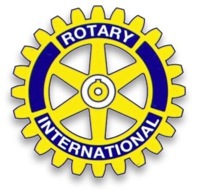 Click here for stories on previous TIRRC conventions. Saturday, December 5th 2009 @ 2:00 p.m.
Any person who feels that he or she has been mistreated by a sworn officer or a civilian employee of the police department has the right to make a complaint. If at any time an officer or an employee of the Metropolitan Police Department mistreats, harasses, intimidates or commits a crime against you, remember the names of the officers, what they looked like and the time and date of the event. You should then report the incident immediately. 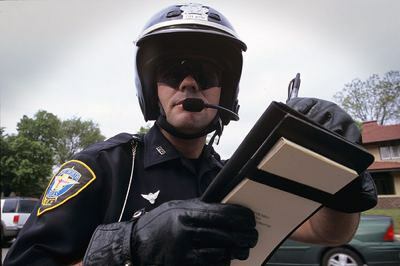 It may be reported to the officer's immediate supervisor, or any other person responsible for supervising the officer. It may also be reported to the Office of Professional Accountability (hereinafter O.P.A. ), the Human Relations Commission or the Offices of the NAACP or the Nashville Area Hispanic Chamber of Commerce. Photo by Kipp Baker. Licensed under Creative Commons. Holland most recently starred in "The Nashville Monologues"
Diana Holland, of Tango Nashville and Hispanic Link Consulting, will be starring in the Groundworks Theatre production "Christmas on the Pecos" December 4-20 at Darkhorse Theater in Nashville. Showtimes are Tue/Thu/Fri/Sat at 7:30pm and Sundays at 2:30pm. Admission is $15 Adults, $12 Students/Seniors, and $10 Tuesdays. 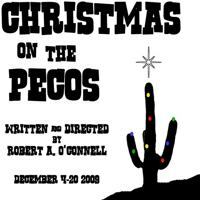 GroundWorks Theatre presents the gentle comedy, "Christmas on the Pecos," written by company founder Robert A. O'Connell. On Christmas Eve, two modern cowboys, sheltering from a storm, find themselves host to a couple seeking protection from the storm and the law. 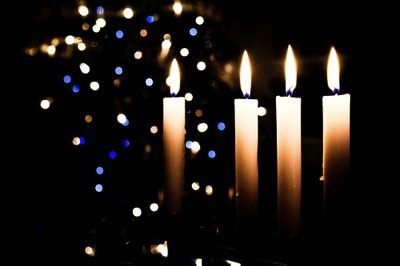 The arrival of Angel Vasquez and Rosa, his very pregnant wife, is soon followed by a man who thinks he just might be Santa Claus, two members of the U.S. Border Patrol and one amazing angel, who all make this a most memorable holy night. The Nashville Scene says in its write-up that "O’Connell exploits the theme of illegal immigration here, presenting a parallel to Joseph and Mary’s journey to Bethlehem, and his cowpoke lead characters battle wits over the pluses and minuses of Christmas cheer." Holland recently returned to acting after a long hiatus. She co-founded Tango Nashville as well as established her own business, Hispanic Link Consulting, but the chance to be back onstage has breathed new life. She recently finished The Nashville Monologues with Rhubarb Theatre Company, but is excited — albeit feeling the pressure — to be the first actor to play Rosa in the premiere. Read the full Tennessean article, which also refers to Argentina-born Holland as being able to identify somewhat with a character looking for a better life somewhere else, here. The above invitation was sent out by the Tennessee Hispanic Chamber of Commerce* to its membership, announcing today's "Financial Peace" seminar in Spanish at the Dave Ramsey headquarters in Brentwood. The seminar will be led by Andres Gutierrez, who is the new face of Dave Ramsey's financial education empire to the Spanish-speaking audience. As Gutierrez puts it, he's "the Hispanic Dave Ramsey." According to Gutierrez, Ramsey's Lampo Group has had trouble getting market penetration with its Spanish-language DVDs, due largely to the fact that even though videos of Dave Ramsey dubbed into Spanish may be effective with the individual Hispanics who take the course, the product doesn't relate culturally to a wider a Hispanic audience. 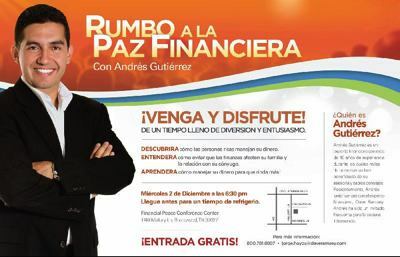 Going forward, Gutierrez will the face of the "Financial Peace" message in Spanish instead of Ramsey. Over the next year, the Spanish-language DVD course will be re-written to apply to a Hispanic cultural perspective, and they will subsequently be re-filmed with Gutierrez as the speaker. Seminars and live events will feature Gutierrez, as well. Dave Ramsey, on hiring Andres Gutierrez: "I've found the guy we're looking for"
"We came to Tennessee, prayed about it and felt it was a calling from God"
"They were looking for someone to help reach the Hispanic community. His books had been translated, but they needed a more personal connection. I've been told he [Dave Ramsey] went back to the office after that event and said, 'I've found the guy we're looking for.'" "They invited my wife and me to visit Nashville," he said. "We came to Tennessee, prayed about it and felt it was a calling from God. I hope to reach the Spanish-speaking community with this commonsense message so people can feel good about handling their finances." Read the whole Schreiner Scene article here. It features a nice picture of Gutierrez with Dave Ramsey at the studio desk. 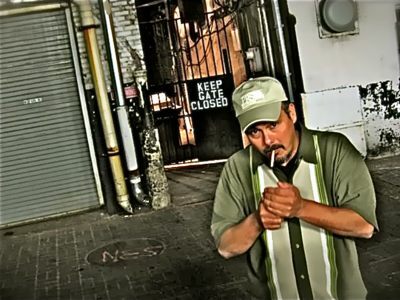 Prior to working for Dave Ramsey, Gutierrez was an owner at San Antonio-based Pax Financial Group, LLC, which still has this video featuring Gutierrez on YouTube. Prior to Pax, Gutierrez worked at MassMutual and John Hancock Insurance. Gutierrez graduated from Schreiner University (Kerrville, Texas) in 1999 with a degree in chemistry. He played for the tennis team, according to his LinkedIn profile. 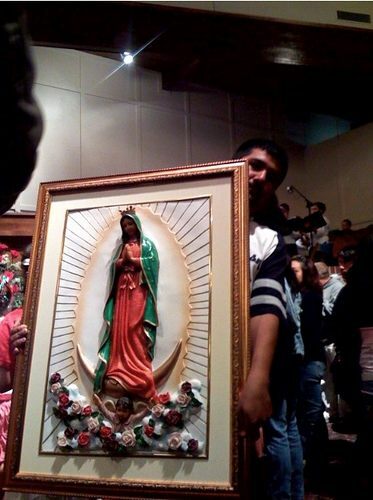 Gutierrez was born in Brownsville, Texas and grew up in Matamoros, Mexico. He moved back to Brownsville in high school and proceeded to Schreiner from there. Both Gutierrez and his wife still have family in Matamoros. Gutierrez and his wife have been living in Nashville for four months, and he raves about how welcoming the city is, even telling the story of a neighbor bringing the couple a homemade pie, "like in the movies." The couple attends La Casa de Mi Padre church ("My Father's House") in Franklin. The history section of the Dave Ramsey web site traces the organization's Spanish-language history back to the 2003 release of a Spanish translation of Financial Peace. In 2004, according to the same section, "Six FPU lessons are translated into Spanish, and more than 150 families go through the Spanish version of the program." A 2006 press release announces the translation of the full 13-week Financial Peace University DVD series into Spanish. The company currently has two FPU Spanish advisors, Bengy del Villar and Jorge Hoyos. The Imagen Latina radio show, hosted by Angelica Blanco, recently expanded into television, with the debut episodes available on the Imagen Latina YouTube channel. 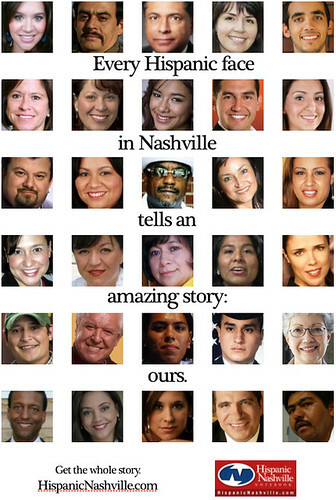 The radio show has been running for two years and was profiled in the Spanish-language Nashville newspaper Latino News in conjunction with the show's first anniversary in 2008. Host Angelica Blanco is also head of Imagen Marketing Consulting and was profiled by eSpanglish magazine in this 2008 article. Blanco is from Colombia, and before she came to the United States in 2000, she worked in the diverse fields of business, dance, and military service, according to her bio. She describes a five-year process of learning English, which culminated in the opening of her own business, Imagen Marketing Consulting. Before she mastered English, however, Blanco worked first "as a cook by day and unloading trucks at a warehouse by night" and subsequently opened a commercial cleaning business claiming such clients as PF Changs and Buca di Bepo. Blanco also worked at Conexion Americas for three years. She was the Manager of Community Outreach and contributed to the development of the Spanish information line and the creation the one-on-one case management program, helping clients with translations, appointments, and interactions with service providers. All of my life I have seen the hand of God at work in miracles, signs and wonders. I am God Most High! and to keep your word. Pray to me in time of trouble. and you will honor me. "God is just like us!" But now I will accuse you. and no one can help you. will show my power to save. Photo by Kyle Steed. Licensed under Creative Commons. The lottery deadline for 2010-2011 enrollment in Glendale Spanish Immersion Elementary School is December 4, 2009. The school encourages families to get their paperwork in now. According to its web site, Glendale Spanish Immersion Elementary offers an exclusive Spanish immersion school curriculum and all incoming MNPS K students are eligible for the lottery, regardless of where you live. There is no longer entrance into a traditional elementary program. 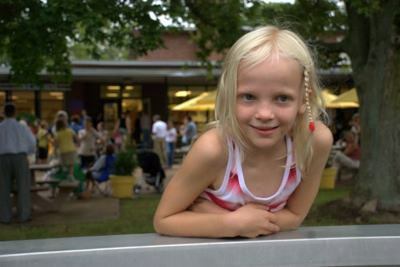 Spanish materials are provided by parents, and no less than 51% of the teaching is in English, according to the Nashville Public Radio piece "Getting into Glendale" produced by Anne Marshall in February 2009. Marshall also reported that the high demand for Glendale was the driving force behind moving to the magnet model, and the change opened up 40 additional seats. Glendale has a small population, an enthusiastic PTO and a newly renovated facility. The Spanish Immersion curriculum is highly desired with 200+ incoming students per year wait-listed. Fabulous school that is only going to get better, especially now that is has become a 100% lottery school specializing in Spanish immersion. In addition, the teachers are amazing and parent envolvement is wonderful. Glendale is one of the best schools I have looked into. Glendale Kindergarten teacher Christina Amezquita was named WKRN's "Educator of the Week" for the week of October 22, 2009. Applications are available via download at www.mnps.org or in person at the Magnet Office (2601 Bransford Avenue Nashville, TN 37206) and must be returned to the office no later than 5:30pm on December 4, 2009. Families interested in touring Glendale Elementary can contact the school directly at 615-279-7970. Marcia Ramirez: "an exceptional talent with a totally cool sound"
This week's Nashville Scene has a story about Tennessee Titans quarterback Kerry Collins songwriting with Lisa Hentrich (Mrs. Craig Hentrich) and also Marcia Ramirez. Read the Scene story here and listen to the song the three of them co-wrote - "Running Out of Reasons" - here. The name "Marcia Ramirez" caught my eye. 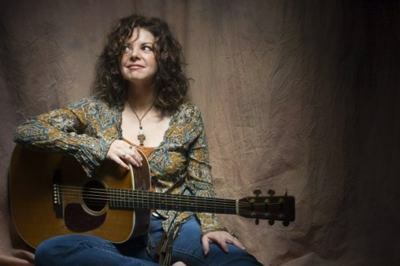 Marcia has lived in Nashville for 25 years and has been a back-up musician for Rodney Crowell, Patty Loveless, and others. She has released three solo CD's, all available at CD Baby, with the latest being "Life Goes On." Her first solo CD, "Compromise" was critically acclaimed and Robert K. Oermann called her "an exceptional talent with a totally cool sound. " Her second CD "The Barefoot Sessions" (2005) includes the original version of "You Belong In The Sun" which was cut by Jo Dee Messina and released on Jo Dee's Greatest Hits CD. Marcia's husband is Mike Waldron. How Marcia Ramirez became Marcia Ramirez is the subject of “Ticket To Tulsa” on "Life Goes On." It is the true story of finding her birth parents, an experience she also describes briefly on her blog here. I love the quiet time in the mornings when I’m the only one up. It gives me time to reflect. Reflect on how blessed I am. Reflect on the choices I’ve made in my life that have brought me here. Some were good choices, and some were just plain wrong. But thankfully, my savior, Jesus Christ has stayed by my side and guided me through all the dumb mistakes I made to lead me where I need to be. He carried me when I couldn’t walk anymore. He pulled me in the right direction when I was heading for disaster. And He stopped me when I was going too far. No matter now I tried to turn away from Him, He never gave up on me. Never. This will be a special night...with some special guests sitting with the band. AND.... the background singers get to OPEN the show with our own material!! So come early and support Kim Parent, Tim Buppert and ME as we sing some of our own songs as the Opening Act that night!! Whoo-hoo!! Christian Broadcast Network's Spanish-language version of The 700 Club - translated as Club 700 Hoy (The 700 Club Today) - is looking for live audience members for a taping today in Nashville. The show has been taped in Nashville three times a year, a week at a time, for the past five years. Club 700 Hoy can be viewed at 6am Central Time Sundays on Galavision, on the show's web site club700hoy.com, and on the show's YouTube channel. Today's guests are Fernando Arau, former co-host of Univision's Despierta America, and Carlos Baerga, major league baseball player from Puerto Rico. The taping will take place at North Star Studios at 3201 Dickerson Pike, Nashville, TN 37207 today November 20, 2009 from 1:30 p.m. to 6:00 p.m. The taping is free, and audience members will also receive gifts. For more information, contact Monica Perez, 700 Club Audience Club coordinator, at entremedioslatinos@gmail.com or 787-485-8758. CBN has broadcast The 700 Club continuously in Latin America for the last 40 years, making it one of the longest-running programs in the region's broadcast history. Now Club 700 Hoy presents its latest cutting-edge Spanish version of the program. 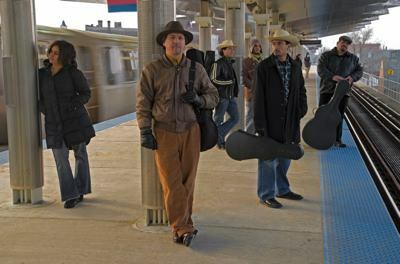 Hosted by reknowned musician Hector Hermosillo and the multitalented Amarilis Rivera. The show continues to offer a mix of commentary, interviews, music highlights, and feature stories. Club 700 Hoy airs in many local markets across the United States, including the number one ranked Hispanic market in the United States, Univision 34, broadcast in Los Angeles. It can also be seen in more than 16 countries across Latin America. Alba Gonzalez-Nylander a winner of Office Depot "Adopt a Small Business Contest"
Alba Gonzalez-Nylander of Alba Videos Production announced her company's winning entry in The Office Depot Adopt a Small Business Contest. The contest asked small business owners to submit short videos explaining how they were weathering the economy, and the video submitted by Gonzalez-Nylander was selected as one of the winning entries. Based in Franklin, Tennessee, Alba Video Production produces television commercials, corporate videos and other video content. In addition, the company provides streaming of video content to the web. As a winner, Alba Video Production received a prize package of Office Depot gift cards and technical services with a value of approximately $2,000. The company's winning video entry can be viewed on Facebook here. Turk, a Rotarian and a retired TV producer and arts administrator, sponsored and accompanied the group on this trip. 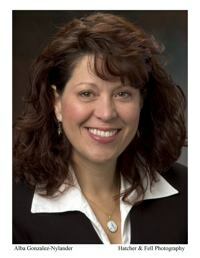 Miller, a native of Michigan and graduate of Middle Tennessee State University and Belmont, is a Spanish translator working in local courts, hospitals and conferences. Peterson, born in Colorado and raised in Missouri and holding a sociology degree from Abilene University, works as an office manager for the Tennessee Respite Coalition, that provides home care services for families and caretakers of the disabled. The Tennessean article on the group and the trip is here. The group's travel blog is at rotaryargentina2009.blogspot.com, with the first post of the trip to Argentina starting here. the best thing that can be done at the state level is to adopt policies that allow all of a state’s high-school students to pay fees at its public universities at the discounted rate that normally applies to people from that state, regardless of their legal status. they are more likely to take advantage of such a benefit and enroll in college as compared to similar students who live in states without an in-state resident tuition policy. The overall numbers of students are not massive. However, if the benefit is available, over time, students do go to college as a result of having such a policy in a state. 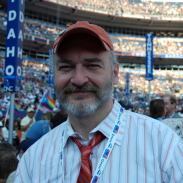 Flores' latest article on the subject will appear in The Review of Higher Education. Flores got doctoral and masters degrees from Harvard University, her doctorate being in Administration, Planning, and Social Policy with a concentration in Higher Education. She has another masters in public affairs from U.T. (Texas, not Tennessee), and her bachelors is from Rice, where she spent one semester at the Universidad de Chile in Santiago. 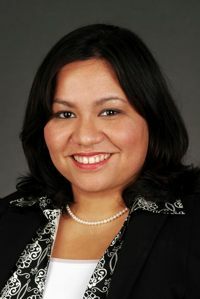 Prior to joining Vanderbilt, Flores served as a program evaluator for the U.S. General Accountability Office and as a program specialist for the Economic Development Administration of the U.S. Department of Commerce. Professor Flores has also served as a policy researcher for the Texas State Legislature and various city governments in Texas. Professor Flores’ work employs large-scale databases and quantitative methods to investigate the impact of state and federal policies on college access and completion for low-income and underrepresented populations. She has written on the role of alternative admissions plans and financial aid programs in college admissions, demographic changes in higher education, the role of the Hispanic Serving Institution in U.S. higher education policy, and Latino students and community colleges. The lawyers who read my blog will be particularly interested the citation of her work in the 2003 U.S. Supreme Court decision Gratz v. Bollinger (dissenting opinion) and in various amicus briefs in the Gratz v. Bollinger and Grutter v. Bollinger Supreme Court cases on affirmative action in higher education admissions. (Flores and another researcher concluded that "it is incorrect to attribute any significant increase in campus diversity to a percent plan alone." Percent Plans in College Admissions: A Comparative Analysis of Three States’ Experiences (2003)). Her publications also include two edited volumes, Legacies of Brown: Multiracial Equity in American Education published by the Harvard Educational Review (with Dorinda J. Carter and Richard J. Reddick) and Latino Educational Opportunity published by Jossey-Bass as part of the New Directions for Community College series (with Catherine L. Horn and Gary Orfield). 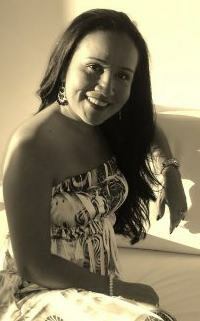 Professor Flores currently teaches courses in college access policy and general education policy. Her recent work includes an examination of the effect of in-state resident tuition policies on the college enrollment and persistence of undocumented students across the United States, an analysis of institutional response to federal and state changes in race-conscious admissions policies and programs, and an investigation of the interaction of state and institutional financial aid policies targeted at low-income students also across the United States. Dr. Flores was recently named a co-investigator in a $1.9 million grant from the Gates Foundation on barriers to college completion, and she was also a research expert for Governor Bredesen’s Task Force on Readiness, Acceleration, Models, and Paths (RAMP UP). Dr. Flores is at the Peabody School of Education at Vanderbilt University. According to Vanderbilt, Peabody is the top-ranked school of education in the nation as ranked by the U.S. News & World Report's 2010 survey. Peabody has held a top-10 ranking for the last 14 years. Some information taken verbatim from Flores' Vanderbilt bio and the Peabody web site. "Finding Nashville's Hispanic Voice" is the title of today's Nashville City Paper article that takes a deeper dive into the city's Hispanic politicians and how more might appear in the future. The election of Latinos can be accelerated by these and other appointments to boards and commissions, said John Lamb, editor of the Hispanic Nashville Notebook — one of several Web sites dedicated to news about the city’s Hispanic community. “Maybe it’s more likely for someone to be electable when they’ve been introduced to the community in places where they can serve,” he said. Lamb pointed to how Bedne’s community involvement served as something of a launching pad. Read the full article, written by Tim Ghianni, here. Schermerhorn Symphony Center will crackle with the bracing, sensuous rhythms of the tango as Giancarlo and the Nashville Symphony perform works by Astor Piazzolla, whose nuevo tango style incorporates elements of jazz and classical music. The Argentine composer was also a master of the accordion-like bandoneón, an instrument that his countryman, the renowned Daniel Binelli, will bring to life in Piazzolla's "Aconcagua" concerto. Keep dancing through intermission as the evening draws to a rousing finish with the hypnotic rhythms and dynamic orchestration of Ravel's always popular Boléro. There's been a renewed interest in Astor Piazzolla's compositions in recent years, and the Nashville Symphony will be helping to promote that interest by recording the three Piazzolla pieces for future release on the Naxos record label. You'll want to be in the audience for this special performance! Tickets start at just $37.50! 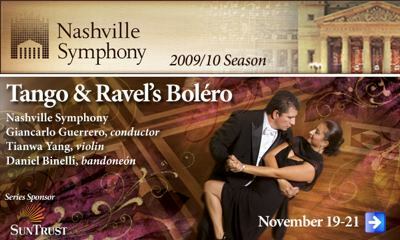 You may purchase tickets online at NashvilleSymphony.org, by calling 615.687.6400 or in person at the Schermerhorn Symphony Center Box Office. Special thanks to series sponsor SunTrust, concert sponsor Vanderbilt University Medical Center and media sponsor Nashville Scene. Where are the English as a Second Language classes in Nashville? 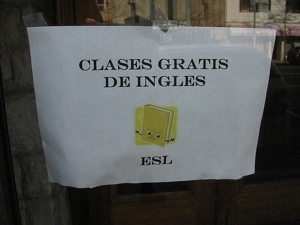 It's a frequently asked question: where are the English as a Second Language Classes in Nashville? Ruben de Pena of Metro Nashville Public Schools offers an answer. Photo by ira. Licensed under Creative Commons.